China and the Philippines should deepen pragmatic cooperation, properly handle the South China Sea issue and be good partners for common development, President Xi Jinping said on Wednesday. 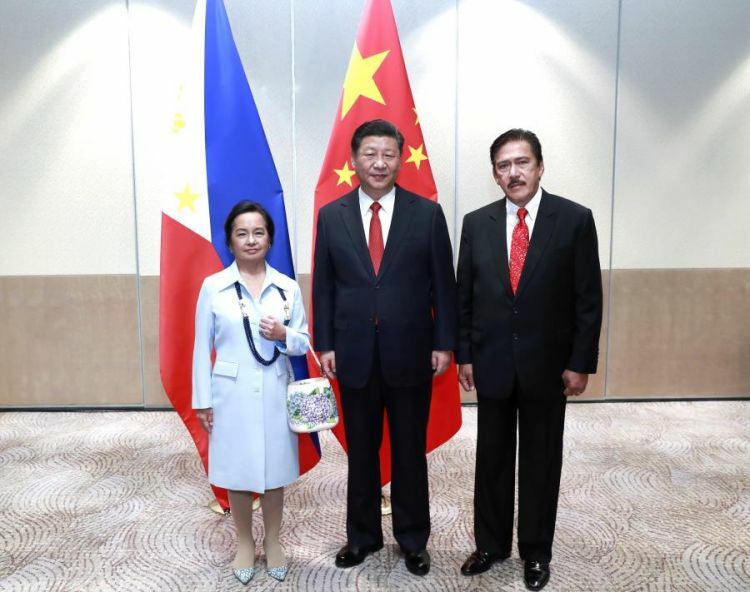 Xi made the remarks while meeting with the Philippines' House of Representatives Speaker Gloria Macapagal Arroyo and President of the Senate Vicente Sotto III in Manila. Calling Arroyo and Sotto old friends and good friends of Chinese people, Xi spoke highly of the efforts they have made to promote China-Philippines friendship. Xi said bilateral relations have developed rapidly in recent years, which has brought benefits for people of both nations and promoted regional peace and stability. Xi said that he and Philippine President Rodrigo Duterte decided on Tuesday to establish a China-Philippines comprehensive strategic cooperation relationship to better guide the development of bilateral ties. The two countries should follow the direction of comprehensive strategic cooperation, deepen pragmatic cooperation, boost people-to-people exchanges and properly manage the South China Sea issue, Xi said. Calling legislative exchanges an important part of China-Philippines relations, Xi said that he hopes the House of Representatives and the Senate of the Philippines will play a bigger role in promoting ties between the nations. The legislative authorities of the two countries should enhance mutual learning, exchange experiences of governance and enhance cooperation in global and regional affairs, Xi said. The two Philippine legislative leaders welcomed Xi's visit. They said that the Philippines-China relationship is at the best level in history. They expressed gratitude for China's support of the Philippines' development, saying that the Philippines would like to learn from China's experience in rapid development. The two countries should enhance cooperation in trade and infrastructure, promote people-to-people exchanges and increase the interests of the two sides, they said. On Wednesday evening, Xi arrived in Beijing after wrapping up a week of state visits to Papua New Guinea, Brunei and the Philippines. While staying in Papua New Guinea, Xi attended the 26th Asia-Pacific Economic Cooperation Economic Leaders' Meeting and met with leaders of Pacific island countries that have diplomatic relations with China. The president's overseas trip sent strong signals of upholding multilateralism, boosting openness and pursuing common development, said State Councilor and Foreign Minister Wang Yi. In his speech at the APEC CEO Summit, Xi said that while achieving its own development, China will make greater contributions to helping countries around the world realize shared prosperity. The president has offered China's solutions and contributed Chinese wisdom to the development and cooperation of the world economy, Wang said. Xi's state visits to Brunei and the Philippines have brought great opportunities for the development of China-Brunei and China-Philippines relations. China has a wide range of common interests with Brunei and the Philippines in the South China Sea, Wang said, adding that the countries should properly handle disagreements through friendly coordination. Xi's state visit to PNG is the first by a Chinese head of state to the Pacific island nation since the two sides established diplomatic relationship in 1976. The visit is of great significance for China in developing relations with PNG and other island nations, Wang said, adding that China will always be good friends of island nations no matter how the international situation changes.